I made myself a summer hat. After looking around and not finding a pattern for a cotton cloche, I decided to make my own. I haven’t really settled on the hat band yet, so this one is not attached. 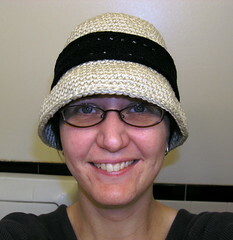 The hat is crocheted with two strands of King Tut Cotton I got from our Twisted Stitcher’s Yarn swap . I used a size I hook with the yarn doubled so that it has more structural integrity. I have written the pattern in spreadsheet form here if anyone is interested. The band is knit using the pattern for this lace headband, but I would definitely add a garter stitch edge if I made it again. It just curls too much, even after blocking. The flower is the Spring Daisy on this page. The brim increases start just behind the ears and go out just beyond the edge of my glasses. 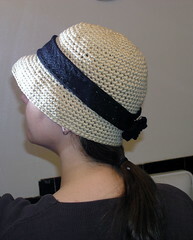 I like the style of cloche hats and look forward to wearing it this summer. I want to resize your fabulous hat to fit my daughter who has a 14″ head. Can you help?? I’ve updated the spreadsheet to include 14″ and 18″ size adjustments. The circumference should be right, but the number of constant rounds may need to be adjusted to get the right height. Look at the top left of the spreadsheet for the other tabs.